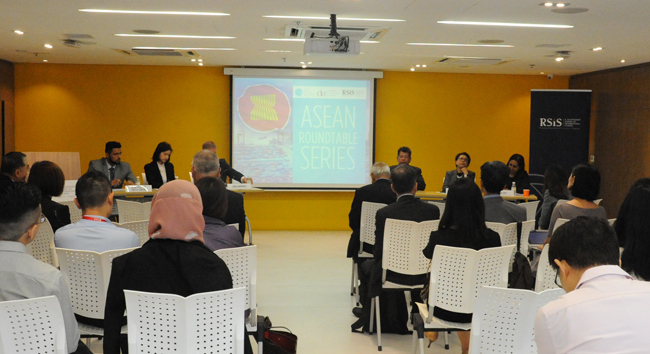 Singapore, 2 April 2019 – Panellists speaking at the ASEAN Roundtable Series on the topic of “Future of ASEAN Trade: Tackling Non-Tariff-Barriers in the New World Trade Order” organised by CIMB ASEAN Research Institute (CARI) concurred that current measures to address NTBs in ASEAN were underdeveloped and stronger political will among ASEAN member states is critically needed to fully address the issue. Professor Kaewkamol Pitakdumrongkit, deputy head and assistant professor at the Centre for Multilateralism Studies, S. Rajaratnam School of International Studies (RSIS), Nanyang Technological University pointed out that NTBs tend to hurt MSMEs more compared to large companies as big firms can better absorb costs incurred by Non-Tariff-Measures (NTMs), and thus limiting MSMEs’ participation in transnational production networks. “On a technical front, capacity training should be provided to ASEAN public officials to equip them to better devise and simplify NTMs, whereas strong political will is required to tackle NTBs in ASEAN. It should be noted that the negative effects of trade on domestic constituencies should be addressed by trade adjustment assistance programmes, not regulations,” said Professor Kaewkamol. Asian Trade Center (ATC) Trade Policy Analyst, Juan Sebastian Cortes-Sanchez presented the findings of NTB-related research conducted by ATC the past year. According to their research, firms interviewed as part of ATC’s continued research on NTBs in ASEAN note a wide and increasing array of challenges across multiple regional priority sectors such as automotive, healthcare and agri-food. This suggests that ASEAN’s past efforts to tackle NTMs and NTBs have not been successful. There are two broad reasons for this disconnect between repeated pledges and failure to deliver results on the ground: the commitments have not always addressed the right target; and timely and effective implementation have hamstrung efforts to tackle existing commitments. ATC research also found that ASEAN has focused much effort on addressing obstacles to trade related to standards. While these clearly matter and should continue to stay in the mix of policies reviewed by ASEAN officials, firm-level interviews conducted by the ATC show that companies face challenges that go beyond just problems with inconsistent product standards. These may include high taxation, discriminatory policies favouring local manufacturers and an underdeveloped intellectual property regime. Expressing the concerns of EU business operating in ASEAN, Executive Director of the EU-ASEAN Business Council Chris Humphrey warns that ASEAN is at risk of failing to fulfil its potential, unless faster and more proactive action is taken on its own economic integration programme, including the removal of Non-Tariff Barriers. “Whilst great work has been done on tariff removal in the region, NTBs remain a major issue when coupled with other measures that hinder rather than facilitate trade. ASEAN is still a long way from being the single market and production base that the AEC envisaged. Unfortunately, this means that intra-ASEAN trade remains low, and indeed lower now than it was a few years ago,” said Chris Humphrey. H.E. 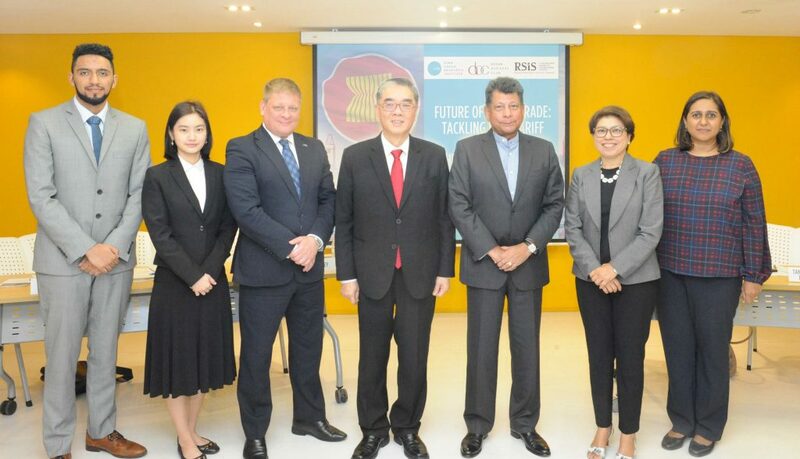 Ambassador Ong Keng Yong, executive deputy chairman of the RSIS and director of Institute of Defence and Strategic Studies, Nanyang Technological University, in his opening remarks, offered a more cautious but positive outlook. “Recent ASEAN Business Outlook survey findings show that US companies remain optimistic about growth prospects and commercial opportunities in ASEAN. Positive assessments like these augur well for ASEAN trade, whether intra- or inter-ASEAN. However, obstacles such as the non-tariffs barriers would obviously put a dampener on growth,” he said. The roundtable discussion was organised by CARI in partnership with the S. Rajaratnam School of International Studies (RSIS), Nanyang Technological University of Singapore.